Question: I would like to discuss an apparent contradiction concerning the impassibility of God (the theological concept that God does not experience pain or pleasure in relation to material happiness or suffering of the living entities). As you know, Jīva Gosvāmi is firm on this point. God’s emotional life plays out under the influence of His svarupa-śakti and that influence cannot be touched by the influence of His māya-śakti. Thus God’s compassion does not arise in relation to the suffering of the baddha-jīvas influenced by His māya-śakti. Furthermore, even God’s desire to bestow bhakti is expressed only in relation to sādhakas who have already been blessed with bhakti by other devotees, and thus the devotees are the only channel through which God’s compassion is expressed to the non-devotee sector. At least this is my understanding of Śrī Jīva’s position in Bhakti Sandarbha. Although he is speaking about Kṛṣṇa, this impassibility would, by the same logic, appear to apply to any avatāra. However, Kŗṣṇadāsa Kavirāja seems to differ, in that he describes Advaita Ācārya in Caitanya Caritamrita (CC) 1.6.97: “Feeling compassion in his heart (karuṇa hrdaya) for the course of the world (loka gati), he considered (vicāra kareṇa) how to bring about the welfare of the world (lokera kaiche hita haya).” Of course we know his insight that followed was his plan to call Kṛṣṇa to the world. Also please see CC 3.3.51-52, 67, 75, wherein Kŗṣṇadāsa Kavirāja despicts Mahāprabhu as feeling compassion for the yavanas. Kṛṣṇa’s ācārya-lilā as Gaurasundara is of course exceptional—a lilā in which siddhas play as sādhakas—but the logic of Jīva Gosvāmi seems to apply to it nonetheless. Answer: You have raised a nice point. My understanding is that it is not the case that He is not compassionate toward conditioned beings. He is. Otherwise, He would not come to this world. But His compassion comes through His devotees. Śrī Jīva Gosvāmi says that Kṛṣṇa’s heart is not melted just by seeing the suffering of a conditioned jīva. Otherwise He would liberate everyone. But because such is not the case, there must be an explanation for it. Jīva Gosvāmi explains that Kṛṣṇa is not touched by material suffering, just as there can be no darkness in the sun. Thus He is not able to empathize with material suffering. Knowing that people suffer is different than feeling it in the heart. Philosophically we also say that people are suffering all around us but we really do not feel it in our heart. Even when we show our compassion by preaching and teaching, we really do not feel their suffering. Kṛṣṇa’s situation is like that, albeit with a difference—we have experience of suffering and thus are able to empathize sometimes. This happens especially if someone close to our heart suffers. Arjuna had this experience in the first chapter of the Gītā. It is interesting that Kṛṣṇa called his experience “weakness of the heart” (2.3). Such a thing does not happen to Kṛṣṇa in relation to conditioned beings. But it happens in relation to His devotees. This is because the antaranga-śakti is working in both, in devotees as well as in Bhagavān. It is common to both. It brings oneness of heart. In the material world, a person is under the influence of the bahiranga-śakti and thus works only for his or her own pleasure. The basic inspiration to act comes from one’s desires that are born of identification with material body. The mind and the desires in the mind are both material. Thus no one can turn one’s mind toward Kṛṣṇa by one’s own effort. This is confirmed by Prahlāda in Śrīmad Bhāgavata, verses 7.5.30-32. In the same way, a pure devotee’s mind is under the influence of antaranga-śakti. Thus such a devotee works only for Kṛṣṇa’s pleasure and has no other desires, anyābhilāśita-śunyam. He cannot have even compassion independent of its relation to Kṛṣṇa. This is depicted in the story of King Bharata. It was not wrong on his part to be compassionate to the deer cub, but it was wrong to be compassionate independent of bhakti-bhāva. That is the reason that he was born as a deer. This is very telling story and should be contemplated upon. Now in the light of this, try to comprehend the psychology of Kṛṣṇa. Kṛṣṇa is not independent although we are used to thinking of him like that. He is actually completely under the control of His devotees, just like a materialistic person is under the control of a wife/ husband, children, wealth, etc. To have a peek into Kṛṣṇa’s mind, it is good to read the verses 9.4.63-68 of the Bhāgavata. Kṛṣṇa is a devotee of His devotee, bhagavān bhakta-bhaktimān (SB 10.86.59). It means that the anyābhilāśita-śunyam verse applies to Him also in relation to His bhakta. What all this means is that He works only for the pleasure of His devotees. Ṡri Jīva Gosvāmi explains that he does even this creation for the benefit of His devotees. There is no other reason. He has no other desires. We often say that Kṛṣṇa is the supreme enjoyer, but we usually misunderstand the statement to mean that He enjoys by Himself. 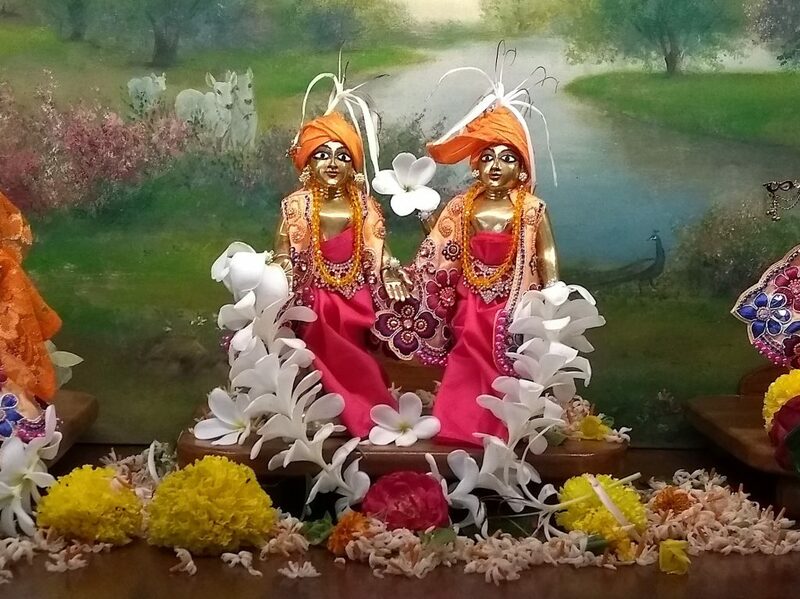 No, He enjoys by giving pleasure to His devotees. His only pleasure is to serve His devotees and He is doing it in so many ways, in so many relations. This is the meaning of being Supreme Enjoyer. So based on this, we can understand that He does not give His real grace just by seeing the suffering of the conditioned jīvas. This is the point that Jīva Gosvāmi makes. Thus when Vāsudeva Datta requested Him to liberate the whole universe and give everyone’s sins to him, the Lord did not comply. When it is said that Śrī Caitanya or Nityānanda liberated the whole world, it is not to be taken literally. It means that was their mood and that they have the power to liberate, but one has to become qualified to become liberated. Otherwise why was He so strict with Chotā Haridās? After all, Chotā Haridās was not such a big sinner. If He came to liberate everyone and give mercy to all fallen souls, why did not give His mercy to Chotā Haridās and why did he ostracize him instead. This seems contradictory. Another way to see this is that it is bhakti that inspires a bhakta to be compassionate. Since Advaitācārya had the mood of a bhakta, and also Mahāprabhu, they felt compassion for the jīvas. But it was certainly not by empathizing with their material suffering. In other words, Bhagavān is not moved by seeing the suffering of the jīvas of this world because He is transcendental to material suffering. He does not feel empathy as we may feel by seeing someone suffering. But He knows that jīvas suffer. Excellent article – so in light of this, when we refer to Krishna as ‘Dina Bandhu’ and other such names, how should we understand it? Is He the ‘friend of the fallen’ because He sends His devotees to help us? Dina-bandhu (lit. “friend of the fallen”) means friend of the devotees because it is the devotees who think of themselves as fallen, dina. Materialistic people have no concept of thinking themselves as dina. Tṛṇādapi sunicena is not their cup of tea. Well, it seems that Kṛṣṇa’s human experience is null. But through his sādhana-siddhas He can understand a little about the suffering of humanity. Now, since His energies are always increasing, Kṛṣṇa would be continually learning about the human experience because it is impossible for Him to apprehend it in its totality (yat kiñcid duḥkha-jñānam astu). However, if the bhakti-yoga process leads to that transcendental impassibility, how can a Vaiṣṇava influenced by the antaraṅga-śakti perceive and be moved by the pain of one who is directed by the bahiraṅga-śakti? How to understand that the Vaiṣṇava is para-duḥkha-duḥkhī or para-duḥkha-kātara? The best way to understand is to become a Vaishnava. Otherwise, it is just armchair theology. Kākere garuḍa kare is only possible by dayāmaya. Thank you, Bābājī. “Kṛṣṇa is a devotee of His devotee, bhagavān bhakta-bhaktimān (SB 10.86.59). It means that the anyābhilāśita-śunyam verse applies to Him also in relation to His bhakta. Please explain, since you state often that jiva and prakrti are anadi- no cause, they are *just* eternally there. Now we hear another reason I haven’t seen elaborated on. Babaji is busy at present, so he asked me to reply. Yes, prakṛti itself is anādi, being one of Bhagavān’s energies. However, a specific universe undergoes cycles of creation and destruction. So the cycle is beginningless, but each universe has a beginning and an end. When it is non-existent, it is in an unmanifest state within Paramātmā. The agent behind this creation, maintenance and destruction is Bhagavān, who acts only for the delight of His devotees, as Śrī Jīva Gosvāmī explains in Paramātma Sandarbha. By manifesting the universe, He gives those devotees, who have not been able to achieve perfection in the previous kalpa, a chance to do so in the next one. In this sense, He manifests the universe for the pleasure of His devotees (see Anuccheda 93.2). Interesting. So If Bharat Maharaj would have seen the deer as perhaps reminding him of being in Vraja, and therefore as a deer who frolicks in the Vraja forests and gives delight to Sri Krishna and His sakhas and the Gopis, then the attachment to the deer would be helpful in bhakti, because the deer reminded him of Vraja and so he wouldnt be bound by that smarana? Yes, the whole idea is to see everything in relation to Krishna and not independently. This is also the purpose of vibhuti-yoga (chapter 10) of the Gita.